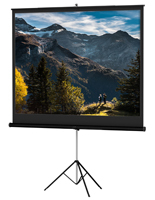 This floorstanding projector wall features a tripod base that makes storage and travel a breeze. Set up this retractable media stand in minutes, and when a presentation is over, roll it into its metal cassette for safe storage. 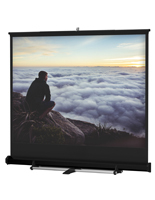 This commercial projector wall has a viewing area of 43"h x 57"w, and it adjusts overall between 60"h-88"h. The portable screen can also be used as a home theatre for family videos and travel slideshows. 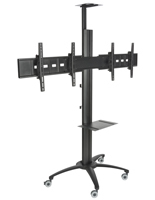 This projector wall with standard video format is one of the best values on the Internet for screening equipment. 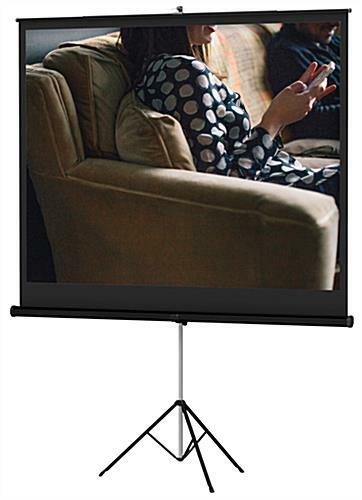 Lightweight at only 22 lbs., this metal movie display is also super durable. 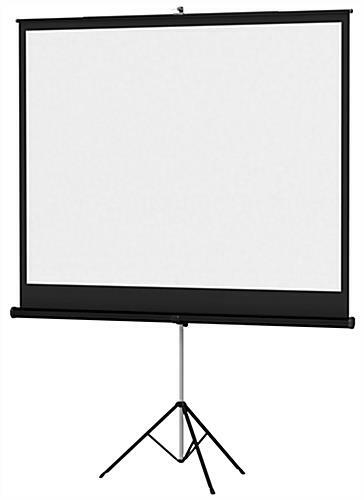 Teachers and business professionals can give an impactful presentation using this easy to maintain floor standing screen. 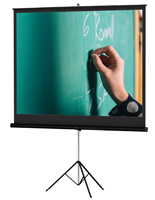 A special feature of this projector wall is that the top of the display tilts forward, eliminating the "keystone" shapes conventional models can have, for clearer moving images.